Today we are back at my favorite South Padre Island birding spot, the Bird Viewing and Nature Center. In case you have not been keeping track, this incredible site has been spinning the wheels on my bird counter as of late. May just have to get the can of WD 40 out and give the gears a drink to cool them off. Once again, we are getting hit with another blanket of snow here in the heartland. Considering we have been fairly dry this winter, we were due for a good covering. There is one benefit to the harsh conditions – more time for blogging! Keeping with the Texas theme and for that matter the bird theme and well the +1 theme I present to you Elmo. Okay, maybe not THE Elmo, but it does have a red fluffy head at least. 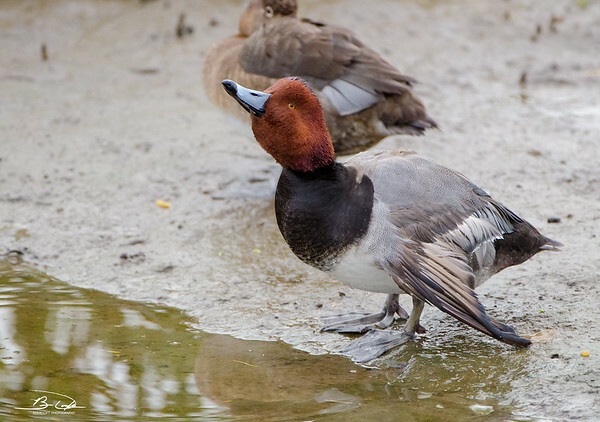 Not very difficult to figure out this particular duck is called a … wait for it … yep, a Redhead. It would save me a lot of time digging into reference books if all the birds could be named after their key feature. While taking the pictures it occurred to me that something might be wrong with this particular Redhead. The Wing was carried lower than I expected and looked a bit underdeveloped. 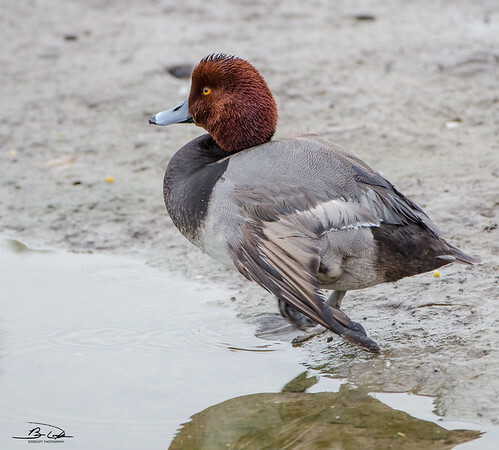 Not being familiar with the Redhead, I tried to find some reference shots on Google – surprising how few pictures there are of this duck standing. Even Cornell was sans standing reference shots. Of the two I did find, their wings were folded neatly along their body. Hit the jump to see more of the Redheads! Not giving up yet, the other explanation is it was a juvenile and awaiting its wings to fill in. Want to guess what pictures there are even less of – juvenile Redheads. So, no validation there, although I am officially leaning to an injured adult male Redhead. 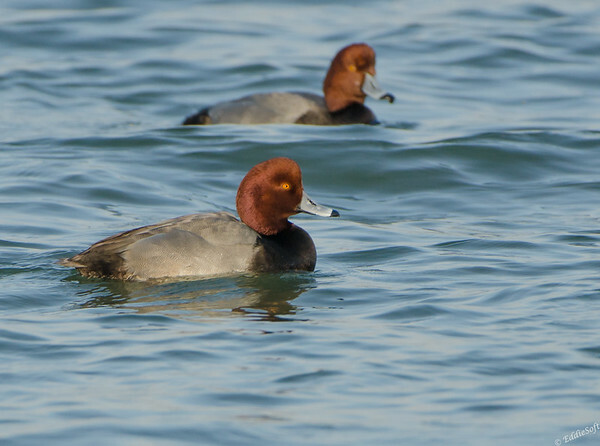 Oh, and there are way too many Canvasbacks (link here) tagged as Redheads on Google Images. You can distinguish the two pretty easy by looking at the overall head shape. 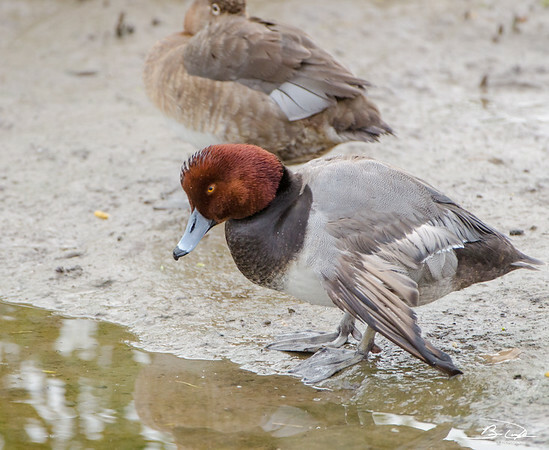 The Canvasback has a more angled head and the bill is drawn out farther. 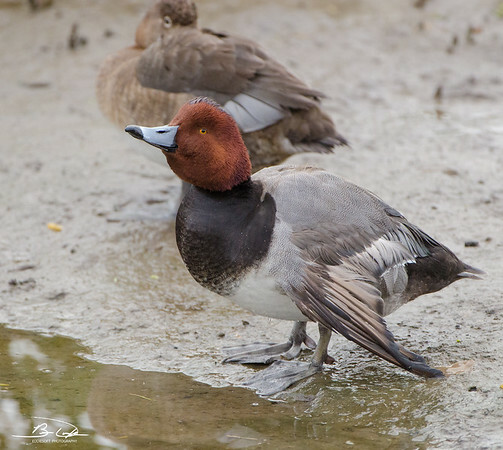 The Redhead is more rounded and has the distinctive grey with black tipped bill coloring. I was beginning to feel bad for the injured Redhead. The dangers those waters hold were already covered in a previous post (link here). Would be tough to evade one of those gators when you are forced to paddle in circles. My concerns eventually subsided the more I observed him getting around the shores. He was doing just fine in and out of the water and definitely getting the needed nourishment. Even looked like the females (that’s one in the back) were checking him out. At one point he gathered himself up, stretched out the vocal cords and started belting out show tunes. Quite the ladies’ man. Thought I would give some more traditional shots of the Redhead. Here are a couple of males paddling further out in the Gulf waters. That eye is really stunning and a feature that isn’t even mentioned at Cornell or my Peterson guide. From a facts perspective, the Redheads are very social birds. They are known to “raft” or gather in large groups, some in the 10’s of thousands along the Gulf of Mexico. Was surprised to learn these ducks practice brood parasitism. This knack of laying eggs in other bird’s nest got the Cowbird on my hated bird list (along with those damn Blue Jays however for a different reason). According to Cornell, the female Redheads are top of their class when it comes to this practice – Bad Redhead, Very Baaaad Redhead. 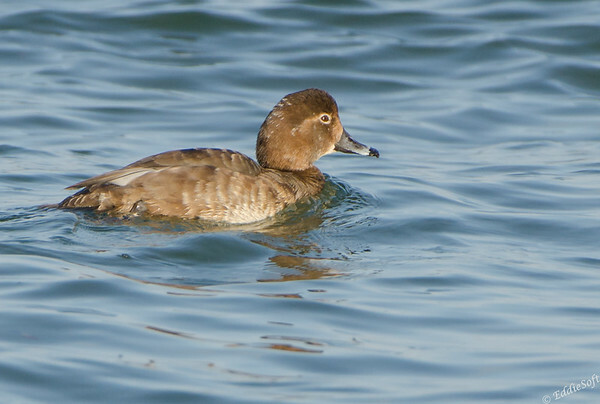 As you can tell below, the females do not carry the same colorful feathering as the male – very common trait among most of the duck species. They do carry the same “dipped” coloring on the tip of their bill. Also just learned that their courtship consist of bending their head back to their tails and then snapping it forward with a cat’s mee-ow. Although I always reserve the right to be creative at times, in this particular instance, I am not making this fact up – honestly… it says it makes a cat sound. Not much else interesting enough to share so I’ll leave it there, besides, I’m out of pictures. Take it easy everyone. Probably will not get a chance to post tomorrow – Linda and I are having our traditional Valentine’s Dinner with live Skunks at our local wildlife park.